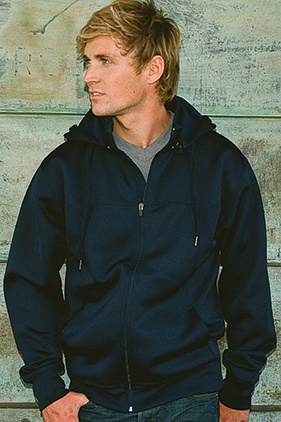 80% polyester/20% cotton 10 ounce water resistant fleece body with 100% polyester pique panels. 100% anti-pill polyester face. Removable zip off hood with interior cadet collar. #5 exposed coil zipper, antique nickel drawcord tips and eyelets. 1x1 ribbing at cuffs and waistband. MP3 holder and eyelet in front welt pocket. Thumbhole detail at cuffs.